How to calculate the amp draw? If you're wondering how to extend the flight time of your quadcopter, you're in the right place: this drone flight time calculator lets you experiment with relevant parameters to find the best combination for your drone. We will also provide you with a simple quadcopter flight time formula that makes the otherwise complex calculations a breeze. Time is the flight time of the drone, expressed in hours. Capacity is the capacity of your battery, expressed in milliamp hours (mAh) or amp hours (Ah). You can find this value printed on your LiPo battery. The higher the capacity, the more energy is stored in the battery. Discharge is the battery discharge that you allow for during the flight. As LiPo batteries can be damaged if fully discharged, it's common practice never to discharge them by more than 80%. If you'd like to change this default value, type the required discharge into the respective field of this drone flight time calculator. AAD is the average amp draw of your drone, calculated in amperes. If you know this value, open the advanced mode to enter it directly into our calculator. If you're not sure how to calculate it, keep reading - we will help you determine the amp draw basing on parameters such as the quadcopter weight or battery voltage. Interested in other calculators related to LiPo batteries? Make sure to calculate the battery life, too! AUW is the all up weight of your drone - the total weight of the equipment that goes up in the air, including the battery. It is usually measured in kilograms. P is the power required to lift one kilogram of equipment, expressed in watts per kilogram. 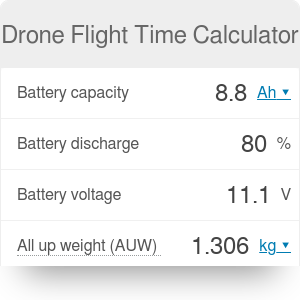 Our drone flight time calculator assumes a conservative estimate of 170 W/kg. Some more efficient systems can take less, for example, 120 W/kg; if that's your case, don't hesitate to adjust its value. V is the battery voltage, expressed in volts. You will find this value printed on your battery. where I stands for the current (in amps) required to lift one kilogram into the air. Let's analyze the following example: you want your drone to hover in the air for thirty minutes to take an aerial video. Will an 8.8 Ah battery be suitable for this job? Determine the maximum discharge of the battery. In this case, you want to stick to the 80%. Find out the battery voltage. Let's assume it's 36 V.
Weigh your drone together with the LiPo battery. We can assume a weight of 2.5 kg. Decide how many watts are required to lift one kilogram. We will take the conservative estimate of 170 W/kg. The drone will hover in the air for 36 minutes, giving you more than enough time to shoot a 30-minute video. If your drone only moves around slightly - for example, during aerial photography - the flight time will be about 75% of the calculated time. If your drone flies in strong wind or moves around a lot, the flight time will decrease to around 50%. If you're participating in FPV racing or flying at high throttle levels, the flight time will decrease to 25-30% of the calculated value. Drone Flight Time Calculator can be embedded on your website to enrich the content you wrote and make it easier for your visitors to understand your message.